Signed and dated upper right: Miró. / 1918. 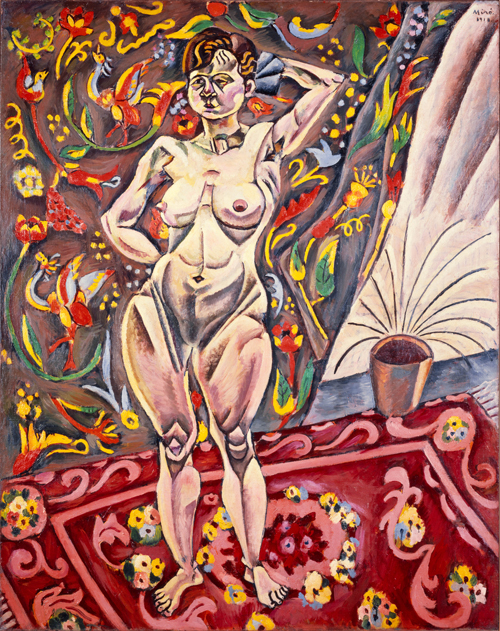 A. Cirici Pellicer, Miró y la imaginación, Omega, Barcelona 1949, no. 6. J.T. Soby, Joan Miró, The Museum of Modern Art, New York 1959, p. 18 (col). J. Dupin, Miró, Flammarion, Paris 1961, no. 55, p. 79 (col). Y. Bonnefoy, Miró, Bibliothèque des Arts, Paris 1964, no. 6. Hommage à Joan Miró, XXe siècle, Paris 1972, p. 17. G. Weelen, Miró, Nouvelles Éditions Françaises, Paris 1984, no. 33, p. 27 (col). W. Erben, Joan Miró, Benedikt Taschen, Cologne 1988, p. 19 (col). G. Raillard, Miró, Hazan, Paris 1989, p. 55 (col). R. Penrose, Joan Miró, Thames and Hudson, Paris 1990, no. 9, p. 18 (col). J. Dupin, Miró, Flammarion, Paris 1993, no. 60, p. 59 (col). 1959. New York, The Museum of Modern Art, cat. no. 8. Los Angeles, The Los Angeles County Museum, cat. no. 7. 1962. Paris, Musée National d'Art Moderne, cat. no. 8. 1964. London, The Tate Gallery – Zurich, Kunsthaus cat. no. 17, repr. pl. 2a. 1974. Paris, Grand Palais, cat. no. 5, repr. 111. Albright-Knox Art Gallery, cat. no. 8, repr. p. 57 (col). 1986. Zurich, Kunsthaus ‒ Düsseldorf, Kunsthalle, cat. no. 14, repr. (col). 1993. New York, The Museum of Modern Art, cat. no. 11, repr. p. 94 (col). Sydney Janis Gallery, New York. Mr. and Mrs. Joseph Slifka, New York.